Teleconferences are a necessary expense for most businesses, but there are many ways to save on conference calls without sacrificing the convenience of multi-person, long-distance telephone meetings. In addition to free services that include basic features, you can find affordable paid plans with fewer limitations and support for very large calls. There are several free conference call services available that support a limited number of participants and usually don't require a reservation. These providers are useful if you don't need a toll-free dial-in number and don't require unlimited call minutes each month. While some charge a fee for added services, you can find companies offering free call recording, moderating controls and scheduling tools. FreeConferenceCall supports both domestic and international conference calls with up to 96 participants. There's no need to make reservations for your unlimited calls, and you can enable call recording so others can listen later. Since you dial a local number, you don't have to worry about long distance or international charges. Calls can last up to 6 hours each. 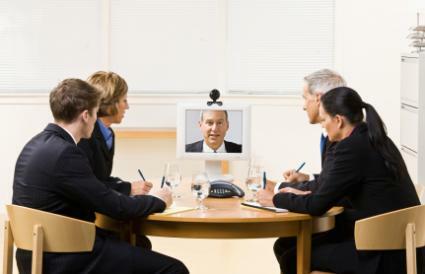 FreeConference supports both scheduled and reservationless conference calls domestically. While the service is free to use, each caller is responsible for any applicable long-distance charges. Add-on features such as conference recording, personalized greetings, desktop sharing and toll-free calling are available at a fee. If you only need to make up to 5 conference calls per month, InstantConference offers a free basic plan. Each call can have up to 10 participants and last up to 6 hours, and the monthly call time allowance is 1,000 minutes. If you go over this amount, you are billed for each minute of overage. While long-distance charges apply, you do get conference call recording, moderating controls, customer support and access to a Microsoft Outlook add-on for call scheduling. Supporting up to 1,000 participants, Free Conference Calling supports calls up to 6 hours long and offers free call recording in the MP3 format. With your free account, you have access to an online conference manager that enables you to view reports of call times, view a list of attendees and give specific participants rights as needed. Long distance charges do apply, but VOIP is supported. The free services may not be suitable if you need to use video or web conferencing with your voice calls. In addition, you may need unlimited minutes each month, support for a larger number of participants and the use of a toll-free dial-in number to reduce long distance charges. If you need access to both HD video and audio conferencing for up to 25 people, GoToMeeting offers a feature-rich package you can subscribe to for either $49 monthly or $468 annually. What makes this service unique is that in addition to being able to join a meeting from a computer and regular telephone, users can download a mobile app to access meetings from their Android and Apple devices. Alternatively, the website offers an audio-only plan if you don't need access to the multimedia meetings. This service supports up to 500 participants, has call recording, includes moderator features and features an Outlook scheduling tool. You can choose to get a toll-free number for an additional fee. Unlike providers that charge a flat rate for a large number of callers, Callworthy can help you save on small conferences since the monthly fee depends on the number of participants. Plans start at $9.95 a month for up to 5 people, and plans for 100 or more callers are also available. If you need access to web conferencing, the website's plans for up to 5 people start at $39 a month, with unlimited audio conferencing included in the fee. As an alternative to monthly plans, you can choose to pay per minute for both audio and web conferencing. A toll-free dial-in number is available at an additional charge per minute. If you don't frequently hold calls and would be satisfied with paying per minute, Budget Conferencing is another option that offers both audio and web conferencing. Call rates depend on whether participants are domestic or international and whether a direct or toll-free dial-in number is used. An operator is available to assist during calls for a higher rate. The website offers paid call recording that you can listen to digitally, download as an audio file or receive in the mail on a CD. AT Conference is another audio and web conferencing service that charges per minute, with rates depending on the type of call, caller location and any added features like call recording. The company offers a free trial to determine if its services are right for you, and there are no activation fees for creating an account. Reservationless calls utilize a toll-free dial-in number, and operator-assisted calls come with the option of call transcription. There's no limit to how many people can be on a call. Offering both pay-as-you-go and unlimited flat-rate plans, Unlimited Conferencing supports traditional and operator-assisted audio conferencing, as well as web conferencing and call recording. For the pay-as-you-go plans, you can choose between a direct or toll-free plan in which you only pay for the minutes used, or you can select a toll-free plan that include between 1,000 to 5,000 minutes per month for a set fee. Web conferencing is free with the pay-as-you-go plans that include a set number of numbers, and your calls can have up to 99 participants. The unlimited plans start at $19.95 a month for 5 participants, with the highest $99.95 a month package supporting up to 20 participants. Unlimited plans are reservationless and feature web-based controls for the moderator. A toll-free number is provided at an additional charge per minute. Most call providers offer both toll and toll-free numbers to use for conference calls. During a toll call, participants are charged per-minute fees based on their long distance service and employers are charged a per-minute fee from the call service, though employers can urge their employees to use free cell phone minutes and other options to save on phone bills. If employees opt for the toll-free number, the meeting organizer is charged a higher per-minute rate to compensate. However, you can find plans that include the dial-in number for no additional charge. Because many conference call services charge by the minute, shortening the length of the call is one of the best ways to save. Consider recording the call instead of allowing ongoing discussion to trim minutes, or e-mail participants preliminary information before the call so they can preview it to eliminate needless reviews or questions. While most conference services operate on a per-minute fee plan, some do offer flat rates for unlimited numbers of minutes. This is a great option for companies that may make multiple conference calls each month with a large number of participants and can lead to substantial savings. Different flat rate fees may even be available for different sizes of calls. For example, a company that makes several calls per month but only includes a dozen participants may be able to pay a much lower fee than a company that makes the same number of calls but includes a hundred participants. There are many ways to save on conference calls if business owners are willing to investigate different features and plans to meet their needs for the lowest price. With a bit of work and some care for how calls are arranged, teleconferencing can be an affordable, effective tool for any size business.